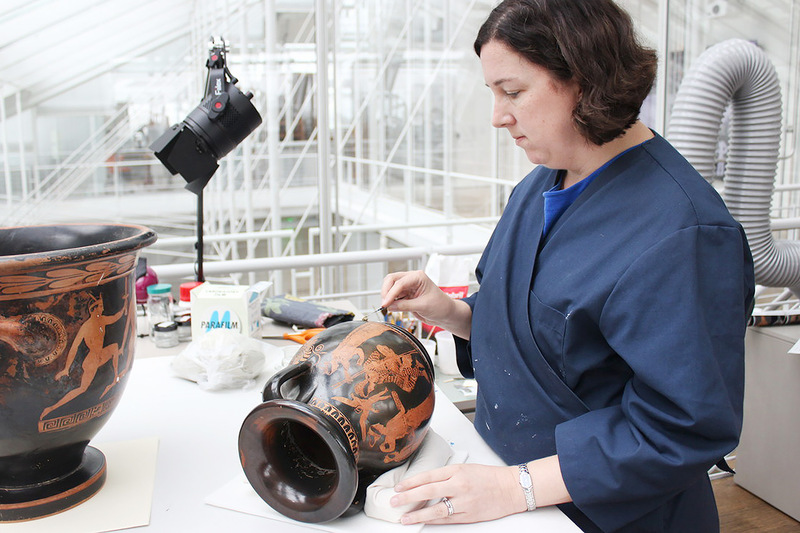 Susan Costello, associate conservator of objects and sculpture in the Straus Center for Conservation and Technical Studies, applies a clay poultice to an ancient Greek terracotta jar. 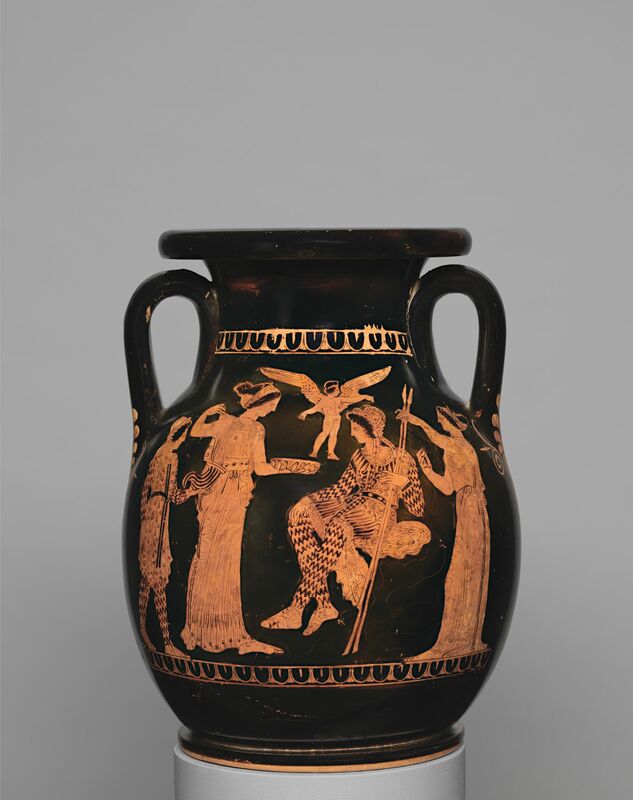 A delightfully detailed scene featuring familiar mythical figures adorns an ancient Greek jar from about 420 BCE, now in the Harvard Art Museums collections. While the terracotta vessel, called a pelike, depicts just one moment in Paris’s amorous encounters with Helen, it is rich in symbolism. Paris, the prince of Troy, gazes at Helen while Eros is crowning him from above. Helen offers Paris a lobed shallow bowl, likely made of precious metal. Behind her, a servant brings a striped drinking horn, perhaps also made of precious metal (indicated by its fluting). The zigzags, stripes, and dotted patterns in the clothing of Paris and the male servant are not only visually interesting, but also narratively significant. They denote that the figures are foreigners: Troy, which was located in Anatolia, was part of the Persian Empire in the fifth century BCE. Pelike depicting Helen and Paris, attributed to the Painter of Louvre G 539, Greek, Attic, 420–400 BCE. 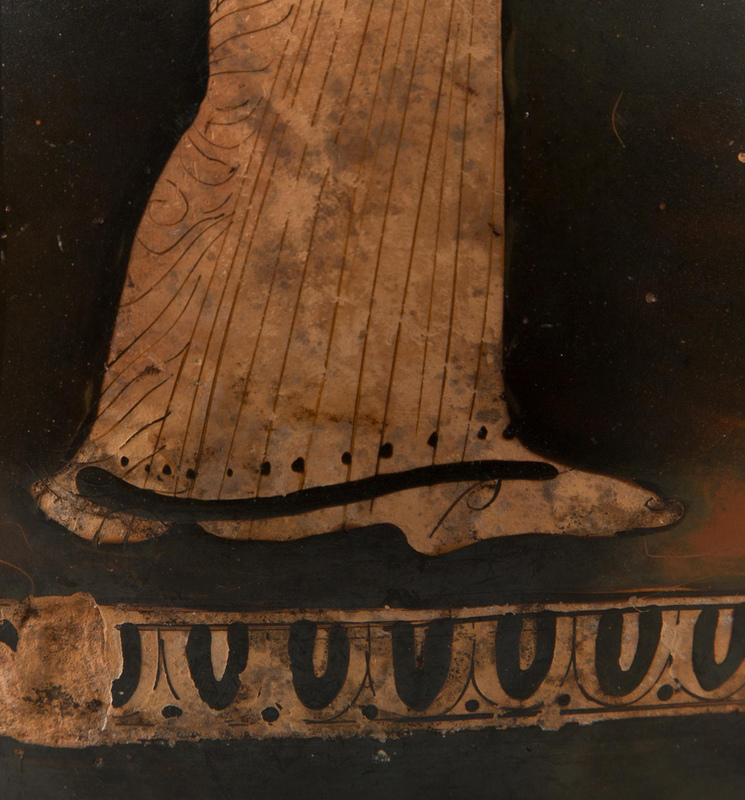 Terracotta, red-figure technique. Harvard Art Museums/Arthur M. Sackler Museum, Bequest of Joseph C. Hoppin, 1925.30.46. Although these valuable cues have long been evident to experts, until recently they were not as readily recognizable to others; black and gray surface stains obscured some of the decoration. With the support of Susanne Ebbinghaus, the George M.A. Hanfmann Curator of Ancient Art, conservators sought to reduce those stains as they prepared the object for display in the current special exhibition Animal-Shaped Vessels From the Ancient World: Feasting with Gods, Heroes, and Kings (September 7, 2018–January 6, 2019). The exhibition highlights elaborate vessels in the shape of real and mythological animals; they were used throughout the ancient world, over centuries and across cultures, during feasts and other ritual or communal gatherings. Drinking horns such as the one depicted on the jar are among the vessels featured. 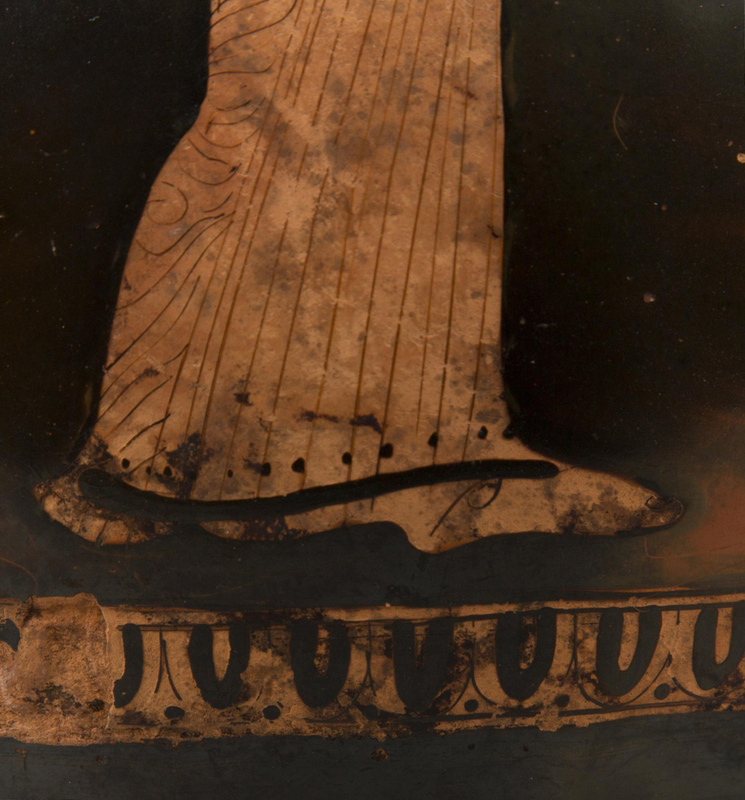 of Black and gray surface stains are apparent on this detail of the jar, particularly on the spotted cloth that Paris is sitting on. of A magnified detail of the stained design of the cloth. of Stains are also apparent underneath the jar’s base. 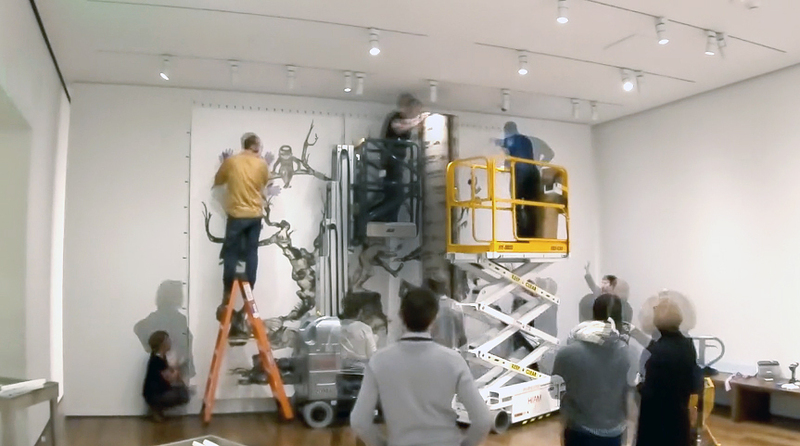 Susan Costello, associate conservator of objects and sculpture in the Straus Center for Conservation and Technical Studies, led the effort to clean the jar. She worked with Katherine Eremin, the Patricia Cornwell Senior Conservation Scientist, and Georgina Rayner, associate conservation scientist, to conduct technical analysis of the jar’s stains. 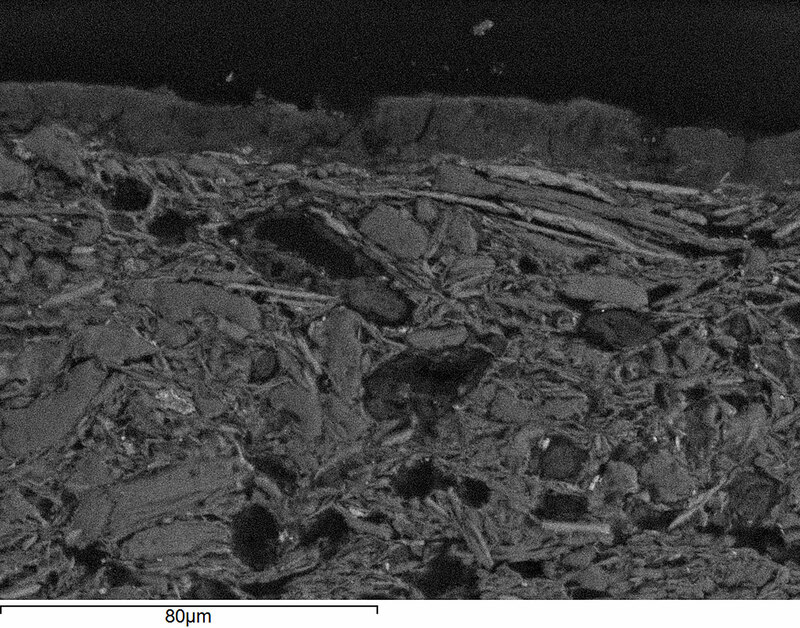 Using scanning electron microscopy, a technique that helps identify materials’ chemical composition, the team determined that the stains were manganese-based burial accretions. These likely appeared during the millennia of the object’s burial in the ground, when it was exposed to groundwater containing dissolved manganese. A magnified detail of the jar’s surface, obtained through scanning electron microscopy, reveals a layer of manganese atop the terracotta. There was just one problem: barely any literature existed on reducing manganese staining in objects like ancient Greek ceramics. “We were basically starting from scratch,” Costello said. She and her colleagues realized they would have to identify a stain-reducing agent through trial and error, using mock-ups. 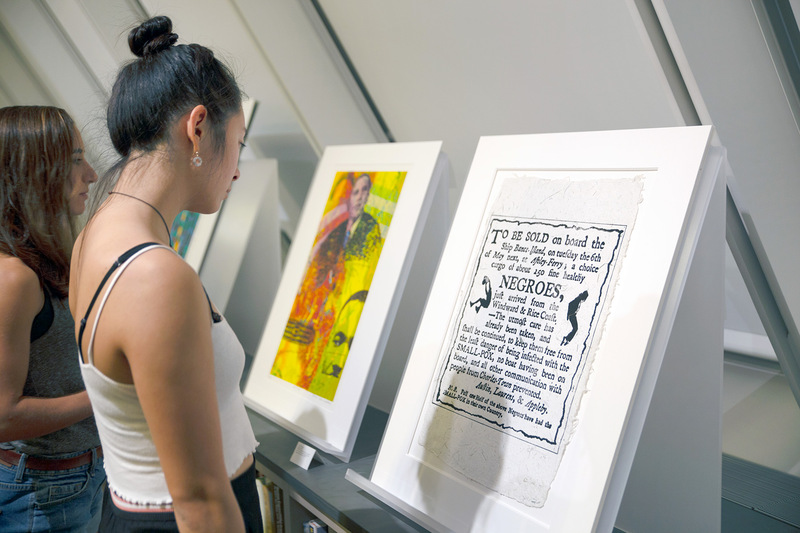 They created terracotta pieces with artificial staining in the Straus Center’s objects lab. The team was also able to conduct tests on a small portion of an ancient terracotta plate from the museums’ collections that appeared to have similar manganese staining, and on the underside of the jar itself (a surface rarely seen by anyone but museums staff). In efforts to break the stain’s bond with the ceramic, the conservators tested a variety of chemicals, but had no success. Then, they thought to try to remove the manganese’s bond by applying a material with a high ion-exchange capacity to encourage the manganese stains to exchange their cations (positively charged ions) with those in the newly introduced material, which would then release the stains. A natural clay called Bentonite fit the bill. “We mixed the clay with deionized water to create a poultice, applied it to the surface of a stain, and covered it with plastic, which slows the drying process, to allow it to dry overnight,” Costello said. of Costello mixed Bentonite clay with deionized water to create a poultice. of After determining on a test section of the jar that the treatment would be safe, she applied the poultice in small quantities to specific stained areas of the jar. of A closer look as Costello applied the poultice. of The treated areas were covered with plastic and allowed to dry overnight. “After sitting overnight, the stain was still there in the morning, but it was no longer chemically bound,” Costello said. To her delight, a gentle rub of the treated area with a cotton swab easily removed the black stains. “We were so happy. We took an idea from theoretical chemistry and saw it actually work. It felt amazing.” See the slider below for a detailed look at a stained area before and after treatment. After the group was able to remove the black manganese stains (the gray stains did not respond as well) in the test spot, Eremin tested another sample through scanning electron microscopy. The results confirmed that the treatment was safe and effective, and Costello was able to use the new technique on all of the remaining black-stained areas. Costello shared the story of the jar’s treatment during the recent annual meeting of the American Institute for Conservation of Historic and Artistic Works, in Houston. Along with Eremin and Rayner, she plans to publish the findings. The conservators and Ebbinghaus are also investigating whether to apply another innovative treatment to remove the gray manganese stains that did not respond to the Bentonite poultice (those remain in less prominent areas, such as on the reverse side of the jar). This fall, visitors can view the jar in a section of the Animal-Shaped Vessels exhibition focused on drinking horns. Nearly 2,500 years after its creation, the vessel will now offer a clearer—and cleaner—glimpse into the ancient world.